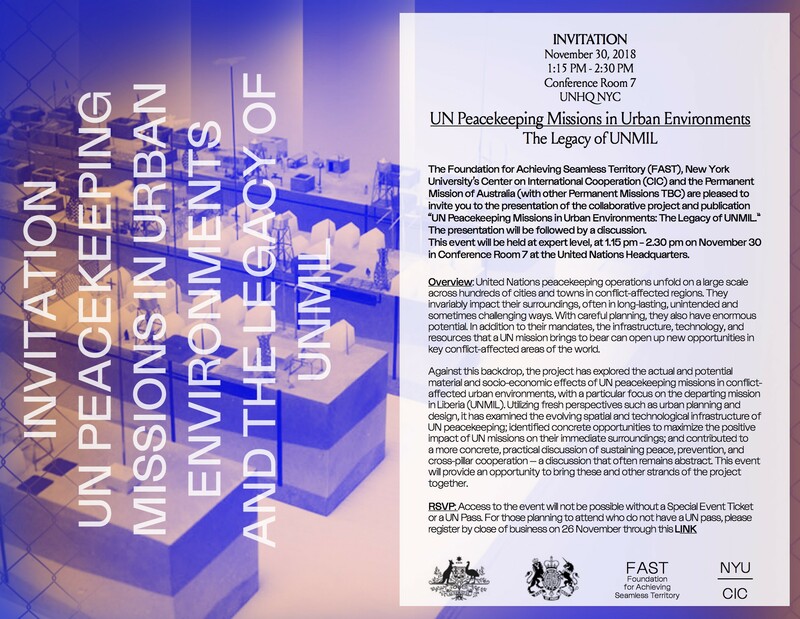 The Foundation for Achieving Seamless Territory (FAST), New York University’s Center on International Cooperation (CIC) and the Permanent Mission of Australia (with other Permanent Missions TBC) are pleased to invite you to the presentation of the collaborative project and publication “UN Peacekeeping Missions in Urban Environments: The Legacy of UNMIL.” The presentation will be followed by a discussion. This event will be held at expert level, at 1.15 pm – 2.30 pm on November 30 in Conference Room 7 at the United Nations Headquarters. United Nations peacekeeping operations unfold on a large scale across hundreds of cities and towns in conflict-affected regions. They invariably impact their surroundings, often in long-lasting, unintended and sometimes challenging ways. With careful planning, they also have enormous potential. In addition to their mandates, the infrastructure, technology, and resources that a UN mission brings to bear can open up new opportunities in key conflict-affected areas of the world. Against this backdrop, the project has explored the actual and potential material and socio-economic effects of UN peacekeeping missions in conflict-affected urban environments, with a particular focus on the departing mission in Liberia (UNMIL). Utilizing fresh perspectives such as urban planning and design, it has examined the evolving spatial and technological infrastructure of UN peacekeeping; identified concrete opportunities to maximize the positive impact of UN missions on their immediate surroundings; and contributed to a more concrete, practical discussion of sustaining peace, prevention, and cross-pillar cooperation — a discussion that often remains abstract. This event will provide an opportunity to bring these and other strands of the project together.